Every once in awhile we read a book that touches our hearts, and for this XOXpert, INSIDE THE O’BRIENS by Lisa Genova was that special story. Read Victoria C.’s review of the book, and share your reviews of this book in the comment section below. Emotional. Heartwarming. Impactful. Lisa Genova gives her readers a look into the world of Huntington’s disease with reverence and compassion. There are certain books you can read and walk away from them. Sure you remember the story, but the impact isn’t there. This is not one of those books. Inside the O’Briens is a story that will create a place in your memory and heart. The author, Lisa Genova, has a gift and it is showcased beautifully in this book. Meet the O’Brien family. They are your typical Irish Catholic Massachusetts family. They yell, they fight, they pray, and they love each other fiercely. Now enter, Joe. He is the father of this crazy band of characters and in many ways tough-as-nails. However, when he is diagnosed with Huntington’s disease, his world gets turned upside down. Soon, the family will have to come to grips with his disease and the possibilities of what that means for them. In the pages of this book, you will read about how the disease progresses in Joe, but you will also see the impact on all those around him. This is truly a book with honesty, heart, and the residence of human nature. It shows the struggles and the pain while still allowing the Joe to maintain humor as he grasps for the dignity he once had in his life. Inside the O’Briens is a story that should be read, discussed, and celebrated for bringing this issue to light. I will be honest with you all that I both listened to this book and read the paperback. I loved every word in the story and needed to go back for another visit to the O’Brien family. What I didn’t expect was to be equally as affected the second time around as I was listening to the audio book. I don’t know how she does it, but the author’s words are more than just text on a page. They are transcendent. Now, I know that you might think I am going overboard here, but this book truly rocked me to my core. I have not read such a powerful book in a long time. Because of that, I have to say thank you. Thank you to the publisher for getting this story out there. 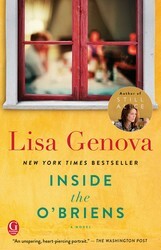 Thank you to Lisa Genova for writing a book that will be stay with me for a long time. Audio Book Note: In the audio version of this book, the reader/listener is given a gift by the narrator Skipp Sudduth. Brilliant. Simply a must listen audio book. The narrator makes the story come alive in a way that truly makes you feel like you are sitting in a room with the character. I cannot express how well this audio book was produced. Normally, I would say that reading the print or eBook version of a story is better than the audio. However, for this book, I have read the print version after I listened to the audio, and I cannot tell you which I liked better. For more on Victoria’s review, check out her blog post here. What an incredible review, Victoria. This sounds like a really beautiful, touching story.